My first-ever visit to New Jersey began rather auspiciously. 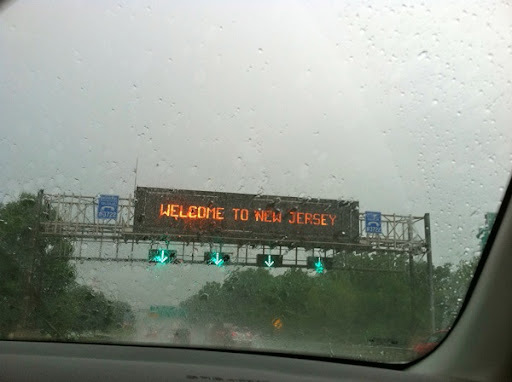 As we crossed the Jersey state line, we saw that it apparently had been raining in the Garden State since Easter of 2007. We had tickets to see Craig Ferguson in Atlantic City. We got a late start due to what we’ll just call a traffic snafu. So by the time we did enter the state, we were running quite a bit behind schedule. The GPS told us it was quicker to take some back roads, so we did. As were driving through one small town, we saw flashing lights ahead, roads closed because of flooding, and stranded cars on the side of the road. Normally, these would all be seen as signals to proceed with caution. But we’d somehow lost our ability to read normal signals a couple hours ago. Before we knew what was happening, we were driving through water that must’ve been a foot higher than the bottom of the doors on the car. Suffice it to say we were tossed around by the wake from the SUV in front of us. All I’m going to tell you about the next 50 miles is that we drove through some more water — stop judging — but reached our seats at Craig’s show in the Tropicana casino showroom five minutes before show time. We had fantastic seats in the 4th row. Craig was his usual hilarious self. We enjoyed the show immensely. Though it was completely bizarre to have arrived on an ark after a multi-hour drive from hell. Craig almost made us forget all that. We ran out of the Tropicana like our pants were on fire. Nothing more to see there. Come to think of it, our pants might’ve been on fire. Our butts were so numb from driving through a monsoon and sitting in the car and the theatre, we’d never have known. Our next destination before sleep was Freehold, New Jersey. We arrived at 1 am and checked into the delightful American Hotel. It was still raining. We fell into instant comas. The birthplace of Bruce Springsteen was a fitting starting point for the Springsteen landmark tour I’d dreamed about for years. Thanks for thinking of me, Bruce. With a plan for an early start in the morning, we regrettably spent a short time at this lovely hotel. The sunshine made it even prettier. It’s right on Main Street. I recommend it. Freehold is a beautiful town! Residents obviously take great pride in homes, lawns, and the city in general. We were surprised of course, because Jersey gets such a bad rap. I must admit the state did look much more appealing to us after we’d escaped both Atlantic City and the rain. A few blocks from our hotel, our Springsteen pilgrimage began. If you really aren’t a fan of Bruce, you may want to just sign off now and head to the gym or some other fun place like that. First stop, 39 1/2 Institute St: Bruce’s family moved here around 1955. They lived on the left side of the duplex for about eight years. I like knowing Bruce watched Elvis on The Ed Sullivan Show in 1956 right here in this house. A photo of Bruce leaning next to this tree from the Born in the U.S.A. album liner notes inspires fans to take the same photo out front. The appearance of the house numbers makes me think the residents don’t mind. Next, a few blocks over is 68 South St: Bruce’s home while in high school in 1963. The family lived on the left side of this one, too. According to local legend — and who doesn’t love a local legend — a fan bought the screen door from the homeowner in the early ’80s, thinking it was the screen door made famous in Thunder Road. Duh. Hey, is that Bruce on the porch? St. Rose of Lima Church and school, 51 Lincoln Place: Bruce attended kindergarten to eighth grade here, from 1954 to 1963. He came back to play a benefit acoustic show in the gym in November of 1996, for Freehold residents only. Next we drove the 20 miles to Asbury Park, along Hwy 18S, which the helpful desk clerk at the American told us was the way to go. She was right. As if it hadn’t been enough to see Bruce standing on the porch of that house…here was his hand, right on the side of the Stone Pony! Now I truly did feel like I was on sacred ground. The club was closed, so I kind of wandered around, checking things out in the light of day. As I turned the corner, I came upon the remains of the shrine to Clarence Clemons left by fans. I don’t know know why this took me by surprise, but it did. The rain had washed much of it away, which somehow made it even more poignant. Tears immediately sprung from my eyes, messing up my sunglasses and my vision. As I took photos, another woman was doing the same thing beside me. We talked for a moment; she’d come from Michigan. It was her first time too. We sort of straightened out some of the items, brushing them off and setting them back up. So much love for the Big Man. I found an open door and went inside. This seems to be expected behavior. You know, like how churches are always open. The Stone Pony is everything you’d expect, and more. The huge number of guitars on the wall surprised me more than anything. It was fantastic to be there on a quiet morning-after. 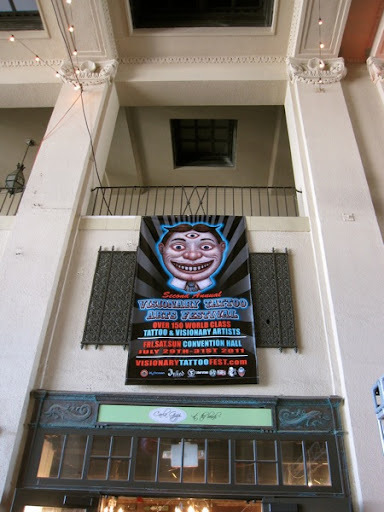 One guy was sweeping the floor, and he never looked up as we wandered freely. Since it was so quiet, my brain bounced unencumbered Springsteen lyrics around madly. Needless to say, I loved every minute of being there, and can’t wait to go back to see a show there. I’ll be quiet now and let you have a look around. After a good long while, we headed back out into the sunshine and sea air, straight out the front door and across the street to the boardwalk. Again, the boardwalk was everything I’d hoped it would be, only better, cleaner, and emptier, since it was still early in the morning. Yeah, that casino. Where casino stuff used to go down. Where the Tunnel of Love video was filmed. Where the scene in The Fighter when Mickey Rourke’s daughter tells him goodbye forever was filmed. 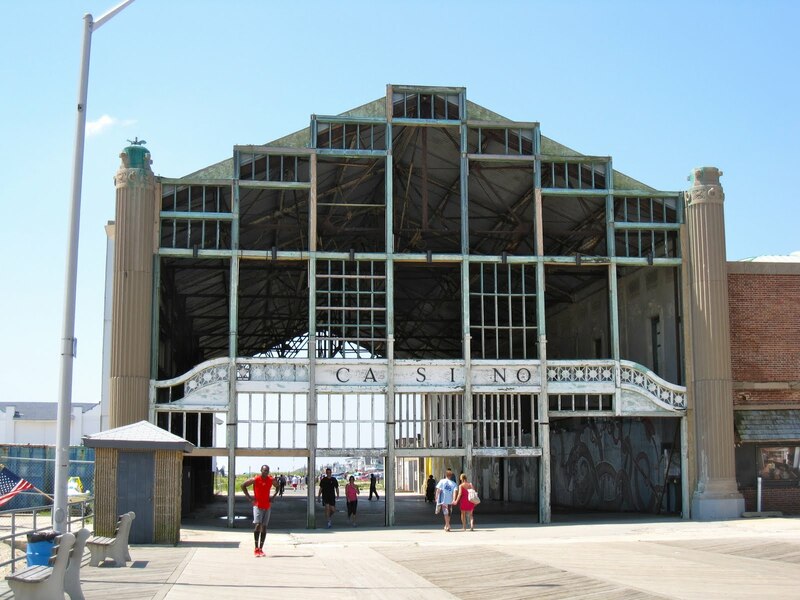 Currently, the casino’s an empty shell that serves as an entrance to the boardwalk. It’s beautiful and perfect. I’m just glad it’s still there. So much of the park is gone now. The casino’s at one end of the boardwalk, and the Convention Hall the other. C’mon. Evidently telling fortunes better than the cops allows one to put in an air conditioner. I can think of worse places to work. The Convention Hall is undergoing a wonderful restoration, and it’s a completely pleasant place to hang out for people-watching and relaxing. Google the Convention Hall for some history if you care. There’s a lot of interesting and surprising history in New Jersey, by the way, aside from Bruce even. The New Jersey Hall of Fame is on the boardwalk, and it’s great. One of the shops inside the hall is a delightful little place called Greetings from Geralyn, owned by a local family. Geralyn makes scrapbooks, journals, lovely cards from vintage postcards, and vinyl mementos. She also has a great selection of letterpress cards, which is always a win in my book. I bought the most perfect journal ever, don’t you think? Some other famous Jersey boy, I guess. From the deck of the Convention Hall, a glimpse of the Wonder Bar to the right shows how close all these legendary Springsteen haunts really are to each other. The colorful, vibrant worlds created in Bruce’s songs seem even more accessible somehow. It’s almost impossible to describe what it’s like to see a place you’ve painted pictures of in your mind for decades; a place that seemed so real yet so imaginary then. Pardon the cliche, but it’s a bit like seeing a ghost. A really boisterous, friendly ghost, but still a ghost. This might have been my favorite sight of the whole day. We headed north along the shore through Long Branch and Sea Bright. Impressive McMansions and Mafia wives out front along the way. Quite scenic. We were on our way to Rumson. That’s right, I was going to “climb the gates of Graceland” as my Blood Brother Bob Stuewe so aptly put it on Facebook. We made it to Rumson, which by the way, is a stunningly beautiful town. I mean stunning. The green lushness rivals upstate New York. Minus a mountain or two. But it’s gorgeous. We decided to find an eating spot before the serious stalking began. It was at this time we realized our GPS was on crack. It took us all the way to Red Bank without passing one restaurant. Several ugly quarrels ensued. We became less enamored of Jersey, not to mention each other. We finally found a spot to grab a bite, and headed back to New York. No climbing of gates this time. But don’t worry, Jersey, we’ll be back. We kind of love you. This entry was posted in American Hotel, Asbury Park, Clarence Clemons, Convention Hall, Freehold, New Jersey, Springsteen, Stone Pony by Kitty Sheehan. Bookmark the permalink. Having grown up with the front of my childhood home in New York and the back in New Jersey, I've always loved the place. Also, cheap gas. Long Branch is worth a visit. My favorite town is Bay Head. It's a tiny beach town that's like a low key version of the Hamptons. They used to have the best bookstore there, too. Thanks for reading, avb. Love the tip. We'll be back. And what can be bad about a low key version of the Hamptons? this reminded me of the movie “ConAir”. Laughs, suspense but no payout at the end! It's like a massage without the happy ending! You gave up on the ultimate stalking experience FOR FOOD? Actually Mr. S, we gave up the ultimate stalking experience for the sake of the marriage. Perhaps I wasn't clear enough about that. Kitty does Jersey. What could go wrong? Great post, great pix. Boardwalk so bright, so happy, so funded. Aurora is risen. Love everything about this post. And now when I look at my “Greetings from Asbury Park” ALBUM COVER I will have context. Well actually, I was alluding to my advanced age. Vinyl's so hip now though, Channy. So it's all good. Can I use hashtags on my blog? You had me at Coconut Base. Actually, you had me way before that. Someone call the NJ Chamber of Commerce and tell them their PSA is ready (except they might want to rethink the Beach Tickets; with all those revenue-generating attractions on the beach, charging for a little sand time seems greedy). The Garden State is in full bloom here; before this, I've only seen it under compost. Thanks for another smart and funny read. Awesome Kitty. Love the photos. Love the love for Bruce. I'm glad you drove straight here and into a plate full of food. Debbie, I thank you for your lovely comments! 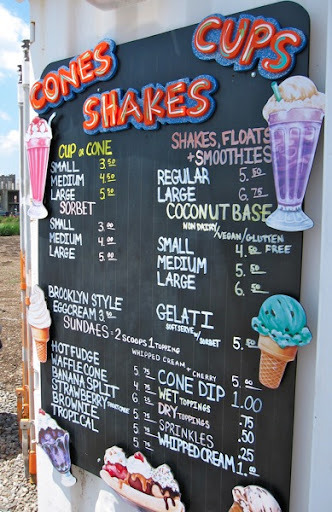 I'm thinking Coconut Base is some sort of auto correct inside joke; I mean we were at the beach though. Nina, thank you! And thank you for having just the right amount of food for the weary travelers. Three or four cakes worked well too. Love you even more after reading this. Thanks for making my home state sound kinda cool. Ah, no. He'd never do that. He's been to several shows with me. He's a good fan, especially for a convert. We'd had a long weekend. But we'll be back. Already plotting. My figurative 'peacock feathers' are extra puffed up today about how proud I am to know you. Love you Marybeth. Jersey Girl. Nice pictures… and a lovely blog! Thanks for sharing your visit/tour! Thank you for reading and stopping by, Gina! I love how how you gave tribute to Clarence Clemons. He was a great Saxophone player. He will be missed.